But seriously: These are beautiful. Wow! This is just the best!! Love the composition, textures and beautiful shades of brown--lovely work! Looks so natural but well thought, the composition looks balanced and the colors are perfect! Very nice! So natural yet as Sofia said a balanced composition. Wow! Love the composition and each nut is so beautifully done! This would take me forever to do. 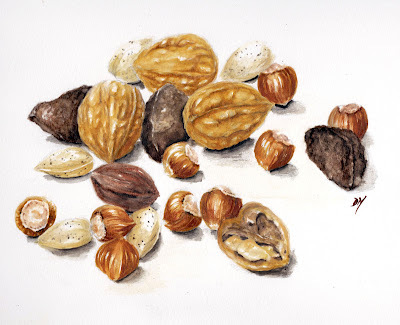 I painted some nuts a few years ago thinking it would be very easy...but it is VERY difficult, so many shadows and rifts. You did a fabulous work !